PCU has stood for more than a decade, hence we would like the company logo to communicate solidness and resilience. Also, given that we produce accessories to protect people from road hazard, it should project product reliability for end users and trust for our direct clients (distributors and wholesalers). A sense of motion in the logo to portray "continuous innovation" may be explored . The shape of the logo should not have distinctively separate parts that seem "broken" as we want to incorporate continuity and liveliness as part of the corporate culture. 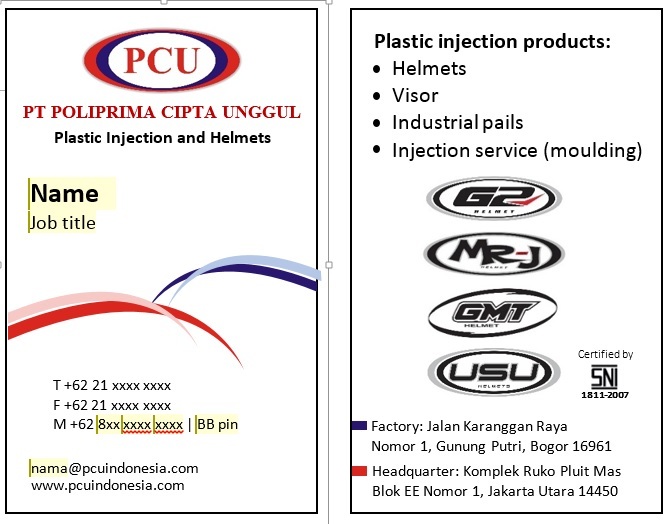 PCU's current logo is available in the name card attachment below. Any of the existing elements may be used as reference if you wish, but fresh ideas are most welcomed! Kindly take note that the logo design is for the manufacturing company and NOT for the helmet brands, hence the logo's appeal should not be retail-like. UPDATE: You may explore designing the word "Poliprima" as the logo. PCU is a manufacturing company that's based on plastic injection. We have been both manufacturing our own products and accepting sub-contracts. Our current product portfolio includes industrial pails, helmet visors and ready-to-wear helmets, of which the latter two are of our own brands (Visor: USU. Helmets: G2, MRJ and GMT). Our focus is shifting towards solely on helmet-manufacturing. PCU's direct clients are mostly helmet distributors and wholesalers, while the helmets themselves are targeted to attract teenagers up until late 30s adults. Choice of stationery: name/business card, letterhead.